It’s one of the most common questions a new parent will get. However, we imagine it’s not often that you’re asked, ‘which toothbrush or toothpaste are you using on your baby’s teeth?’ Well, it’s not a very common question to be asked but trust us, it’s an important one to consider. When are they best to go to the dentist? In the beginning, we are all very keen to count our baby’s teeth and suffer from sleepless nights when they are teething, but at what point should we consider cleaning their teeth or taking them to the dentist? There are lots of different answers you may have heard; when your baby’s first tooth appears, when they are age 3 and will co-operate better, or just when they have toothache or any other dental problems. So, which is best? The best advice we can give? The best advice is to see a dentist as soon as possible. Often a parent’s own dental experiences can stop them from taking their baby to see a dentist, but it’s important to register your baby as soon as you can after they are born. 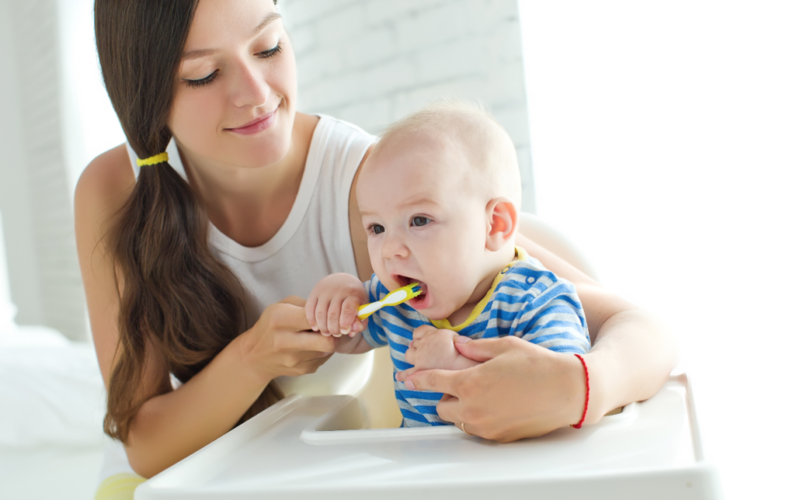 Your dentist can give you lots of great advice about a healthy diet, how to clean your baby’s teeth and how to deal with teething when it arrives. Not registered with a dentist? Darwenside Dental practice are taking on NHS and Private patients. Get in touch for more info.